One of the joys of music is sharing it. You practice alone, you learn with a teacher, but playing with other people can give you plenty of pleasure, as well as opening your eyes to other techniques you can use and improving you as a musician. It's quite common for a teacher's pupils to put on recitals every year. This is fine for kids, who can show off how far they've come to adoring families, but for adults it can be a little different. Yet a recital for family and friends gives you a chance to show off, too, and it can be done in a relaxed manner. It might be possible to play a duet with another pupil, for instance, or four-handed on piano. Think of it more as a soiree than a recital - where everyone has fun. If you know others learning the same instrument, sit down with them and play a duet. You can learn from each other - and make practice a great deal of fun. Even if it's not perfect, enjoy it. For you it's even better if the other person is a more advanced player, as you can pick up tips, and it won't seem like a session with your teacher. If you have other friends learning instruments, maybe you can form a small group to play. This depends, of course, on the instruments involved - a string quartet, or strings with piano. It will broaden your experience; you'll try new things, and learn the pleasure of making music with others. Spontaneity is always fun. Invite some friends over who play, have them bring their instruments and get out music for duets, trios and small groups. You might also try some different styles - play a little folk music, perhaps, or improvise around a theme (this will probably only work with more advanced musicians). If you want something even less formal, and you know how to play blues or jazz, then simply jamming with other musicians can be a great way of improving your skill. In these jams, no one really minds how good or bad you are. It's more about the enjoyment of playing together, but you'll discover you also learn a lot - how to back others, how to solo - which can be useful to you later. 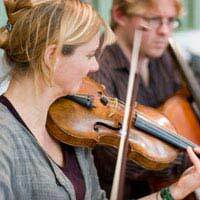 There are plenty of amateur orchestras around, many of whom are looking for instrumentalists. This isn't for novices, of course, but if you've reached the stage where you feel confident enough to work in a situation like this, it can be invaluable. You'll learn to work with a large group of people in a disciplined situation under the leadership of a conductor. You'll just be one small cog in a much larger machine, but that's important, too. An orchestra makes a huge sound, so be prepared for that, and you'll need to be willing to put in the time to master whatever programme you're working on. But simply by observing and participating you'll come away with a lot more knowledge and technique. It might not be easy, but the results are remarkably worthwhile.